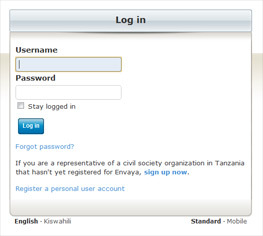 When you first register for Envaya, you are automatically logged in to your new account on Envaya. 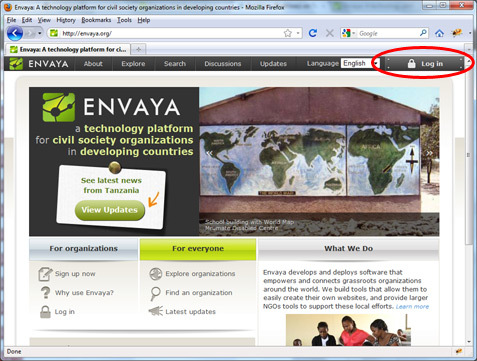 However, the next time you return to envaya.org, you will probably be "logged out", and will have to log in first before editing your website. Then, type your organization's username and password, which you selected when registering your organization for Envaya, and click the blue button to log in. If your username or password was entered incorrectly, Envaya will display a red error message. Try typing your username and password again, making sure that your password is entered using the same uppercase or lowercase letters as when you registered, then click the button again. 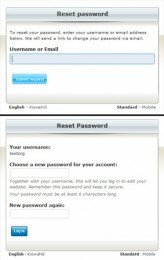 If you are unable to log in to Envaya, you can reset your organization's password. Choose a new password for your organization, and click the button to log in. If your organization does not have an email address, or if you cannot reset your password using the steps above, go to http://envaya.org/envaya/contact and send us your contact information so we can verify that you should have access to the account.